Wildband WiMAX/3G/WiFi Mobile Antennas - WiFi and WiMAX Long Range Antennas, Wideband Mobile Antennas,OA-3702,OA-1204 for WiMAX Mobile solutions. WiBorne 3.0 Bolsters Revolutionary Technology for WLAN Appliances - AWG, HSG, and W3G for best ROI and protection of your wired / wireless infrastructure. 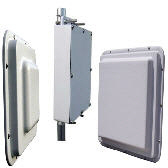 Superior performance 802.11a carrier class of base radio and CPEs. Model WAP-500 / CAP-5000 series. Up to 108 Mbps or 145 miles of range. WiBorne WAP-2450 is a high performance dual radio & dual standard wireless bridge / AP / WDS mesh node system that, having two independent radios inside, provides high capacity, high-speed point-to-point links and point-to-multipoint coverage. WiBorne CAP-2409/2416 are 2.4GHz 802.11b/g compatible multi-client / bridge / access point / route / WDS. Integrated in to 9dBi or 16 dBi antennas delivering superior RF power for cost effective solution. WiBorne's 802.11 standard RFID Readers enabled. Extending WiMAX technology with your existing WiFi deployment? WiBorne announces carrier-class of WiFi radios AP, WAP-750, that is backward compatible with WiMAX for cell –through-base-stations. Long Range Outdoor Wireless Access Point WAP-400 is specially designed for point-to-multipoint applications to provide an easy solution for connecting many locations through wireless. WiBorne outdoor mesh AP router, WAP-192M, is a cost effective and simplicity device that supports wireless mobile with multiple points of connection seamlessly. It can bypass obstacles with different signals for 802.11 b/g. Portable CPE Devices offer your nomadic broadband services that require small portable CPE devices and broad ubiquitous coverage area. Base-Station-In-One-Box provides you instant deployment for large area of Hotspot or public HotZone up to couple of miles! WiBorne's Enterprise Wireless Switch , AWG-1000, creates a virtual overlay network on top of an existing wired infrastructure. It offers benefits such as simplified network deployment, integrated security, increased scalability, and eased management. AWG-1000 offers you: Access Control, RF management, Firewalls, Scalability, Guest Access, Remote Support, Network Planning, and Support of VoIP . Come see WiBorne at Computex/Taipei 2007, Hall 1 C1027. Come see WiBorne at Taipei, Taiwan. Come see WiBorne at Hannover, Germany. 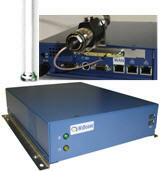 "Success Story: WiFi Pleasant Hill, Missouri"
Wiborne launches Short Range Wireless Products. WiBorne consults with WISP to deploy large scale long-range 802.11 services worldwide: Brazil , India , New Zealand, Philippine, Taiwan , and USA. WiBorne opens office and organizes a development center at Taipei , Taiwan . Taiwan is one of the most important computer hardware centers in Asia and many of the world's largest system integrators have component centers located there. Copyright 2005-2016 WiBorne, Inc. All Rights Reserved. USA.